Spar Cottage01263 715779work01603 870304fax Self-cateringSpar Cottage, a listed cottage, is situated in the centre of Blakeney, a village on the coast of North Norfolk with pubs, restaurant and shops within walking distance. The open wild salt marshes and quayside make the views dynamic and it is possible to take a boat trip to visit Blakeney Point and the seals around it. The Georgian market town of Holt is a short drive away with interesting shops and galleries. GradeII listed brick and flint cottage. 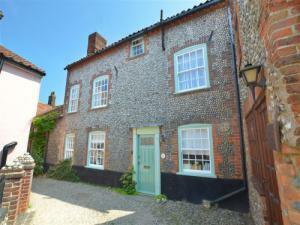 Spar Cottage, a listed cottage, is situated in the centre of Blakeney, a village on the coast of North Norfolk with pubs, restaurant and shops within walking distance. The open wild salt marshes and quayside make the views dynamic and it is possible to take a boat trip to visit Blakeney Point and the seals around it. The Georgian market town of Holt is a short drive away with interesting shops and galleries.